Are you building your dream home or renovating your current one? Making a bunch of design choices is pretty exciting but can feel overwhelming if you don’t know where to start. We understand that new countertops are a huge investment and we want you to be informed to make the right decision. Here are a few things to keep in mind as you’re selecting your perfect counters. It’s very important to know what type of countertops you want. 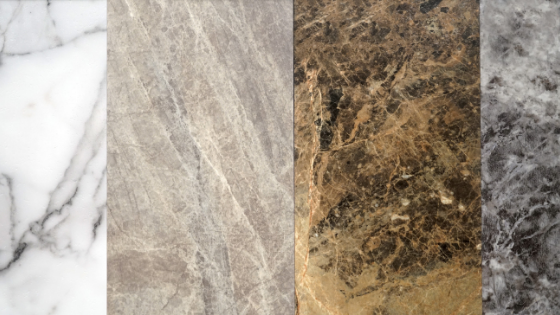 There are many different materials to choose from including quartz, marble, and granite that are all offered at Granite 4 Less. These three materials are not created equally and are actually quite different. It’s important to understand the differences between these materials. Marble, for example, is very beautiful and often chosen because of its beauty. But it is soft and very porous and requires a lot of upkeep. Granite is chip, scratch, and heat resistant. But it is also porous and requires a sealant. Quartz is chip and scratch resistant and is non-porous, but it is not as heat resistant as granite. Each comes with a set of pros and cons. It’s up to you to decide which material best suits your lifestyle and needs, but don’t worry; we’re here to help. As you do your research, it’s likely you’ll have one or two (or eleven or twelve) questions. We don’t expect you to know everything about this process. We’re the pros, not you! We know this process can feel overwhelming, especially when you’re walking through a showroom, like ours, with many different options. We’re here to help you all along the way. It’s best to ask your questions (write them down if necessary!) to help avoid any mistakes when selecting your counters. As homeowners select their counters, it’s also important for them to consider the type and style of sink they’re going to use. To make this process easier for you, we offer a wide variety of sinks and faucets to complement your counters and design. If you’re unsure, one of our knowledgeable staff members can help you find the right one. Picking the right color and right amount of veining (what we refer to in the industry as movement) can certainly be challenging. It’s important to consider a couple of things. Make sure to bring a cabinet door with you as you are making your selection. You might want to bring a flooring sample with you, too. Another thing to keep in mind is the kitchen floor plan and the layout of your cabinets/counters. If your stone has a lot of movement and your layout is very angular or has many corners, it can be difficult to make the seams properly align. Remember, the bigger the movement, the harder it is to keep it cohesive throughout the layout. What style is your kitchen (or bathroom)? Are you going for a more modern look? Traditional look? The edge profile you select can be the perfect finishing touch in tying everything together and keeping a cohesive look. Bring a photo of your kitchen or an inspiration photo so we can help pick the right style for you and your space. Stop by or give Granite 4 Less a call for a free estimate! Find what your dream home will look like at a great price, with a completely free consultation.